A salmon fishing house set on the bank of the River Severn, dating from the earlier C19. The building is constructed from rendered brick with brick stack, and the roof is covered in plain clay tile. The fishing house has a simple two-room plan, with an additional lean-to at its northern end. EXTERIOR: The building is one-and-a-half storeys high. The main elevation, facing the river, has a central entrance doorway approached over an apron of square clay tiles, flanked by small, vertical windows with upright iron cames. The south elevation has a timber hatch with moulded edges set into the gable to light the first floor. The other elevations are blind. A short, square, brick stack is situated at the north gable end. INTERIOR: The ground floor is divided into two unequal rooms. That to the north has a transverse chamfered beam of heavy section, and a C19 cast-iron range set under a large bressumer which runs the depth of the building. The floor appears to be of rammed earth. There is a partition south of the entrance which houses two C19 plank doors; one gives access to the storage area in the ground floor, the other to the staircase. Both have cast-iron strap hinges and one a thumb-latch. The stair is a simple ladder-type example rising to the first floor, which is largely contained within the roof space. There are exposed roof timbers consisting of paired common rafters. The northern end retains its relatively wide early-C19 floorboards. HISTORY: The fishing house was constructed above Madam’s Pool on a turn in the River Severn during the early part of the C19: it appears on the 1841 tithe map. It was designed to take advantage of its position for lave-net salmon fishing, which was then a significant local industry. Waiting for low tide, fishermen would wade out into the river with large, Y-framed lave or draft nets in order to capture by hand the salmon made visible by the lowering water level. The practice was widespread along both banks of the Severn into the C20. The fishing house at Elmore is one of only a handful of fishing houses associated with this industry to remain in the area. This entry was posted on Sunday, April 25th, 2010 at 11:52 am. 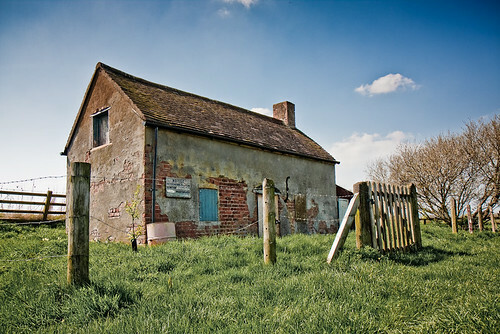 It is filed under Featured Posts, Image Blog, UK and tagged with Building, Gloucestershire, Nature, Ruin, Rural, Trees. You can follow any responses to this entry through the RSS 2.0 feed. If you are wondering why I am asking, it is just because I am the owner of the house now. Glad you like it anyway – it’s definitely a nice walk along the river. Any chance you can send me a copy of the pic (and any other pics you have of around there)? Thanks! It was like a lot of my photos really – I had my camera with me, took the photo, liked it, posted it. I’ve walked past this place a few times and thought it would make a good shot – glad you liked it. What made you decide to take a picture of this place and put it up out of interest?